Don't forget to check the weather. We've been treated to the highest scoring first nine weeks of football in NFL history. Yet as we move into November, the weather is going to start getting colder and harsher. The cold has a way of slowing everything down, making everything just a little bit harder. The wind will start to become a factor as well. And we're only a few weeks away from our first snow bowl. In upcoming Week 10, there will likely be five games played in weather in the 30s and three more games in the low 40s. That's over half of the games on the board being played out in the elements. This is all pertinent, because as scoring as gone up the totals have gone through the roof. The books have scrambled to catch up with the high-scoring league. All of the totals have been massively inflated. So now might be the time to start betting the other way. In football betting you always want to be out in front of the trends rather than trying to catch up to them from behind. If you were out in front of the 'over' trends earlier in the year, then that is great. Now all bettors are expecting shootouts each week. But it is the same story every year. And as the weather turns and we barrel headlong into winter, points are going to become just a little more difficult to come by, and those 'under' bets are going to start cashing. 1. Los Angeles Rams (8-1) - I know the assumption this week is that the Rams are going to bounce right back from their first loss of the season and go back to their winning ways. But teams tend to have a letdown after their first loss of the season, and the favorite in the Seahawks series is just 2-5 ATS. 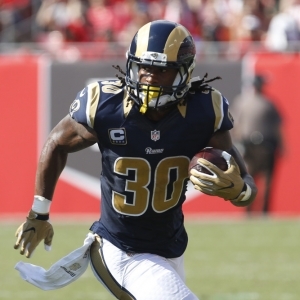 The home team is 8-3 ATS, though, and the Rams are 5-1 ATS in their last six at home against Seattle. 2. New Orleans Saints (7-1) - The thing that stands out about these Saints is their physicality. On both sides of the ball this is a team that seeks out contact and plays tough, aggressive football. The Saints are 41-17 ATS against teams with a winning record, and they are 19-7 ATS in their last 26 games. 3. New England Patriots (7-2) - Bill Belichick will be going against one of his former players this week when he matches wits with Mike Vrabel. The Patriots get the Titans off a short week, and New England had no problem manhandling the Titans in the playoffs last year. The Patriots are 5-0 ATS in their last five games against the Titans and 7-2 ATS in this series over the last 20 years. 4. Kansas City Chiefs (8-1) - The Chiefs should beat the Cardinals by about 40 this week. But one thing to keep in mind is that Kansas City could be looking ahead to next Monday's showdown with the Rams in Mexico City. Kansas City is 12-2 ATS in its last 14 games and 6-2 ATS in their last eight home games. 5. Pittsburgh Steelers (5-2-1) - Here come the Steelers. They've won and covered four games in a row, each by at least a touchdown. They've outgained those opponents by 145 yards per game. The Steelers are 6-0 ATS against the Panthers and 10-5 ATS in their last 15 games against the NFC. However, they are just 3-8 ATS in their last 11 games following a win. 6. Carolina Panthers (6-2) - Let's slow down on the whole "Norv Turner is revolutionizing the Panthers offense" talk. There has been a comical amount of praise heaped on Turner this week. This guy hasn't coordinated a Top 10 scoring offense or a Top 15 total offense in more than 15 years! This year, for as "great" as everyone is saying the offense is, they are still just No. 13 in total yards and No. 11 in points. 7. Los Angeles Chargers (6-2) - The Curse of the Chargers Kicker is real. Over the last five years they've lost 11 games by three points or less while employing some of the worst kickers in the game. In fact, since bringing back Drew Kaser, the Chargers are on their sixth different kicker over the last 22 games. 8. Minnesota Vikings (5-3-1) - The bye week comes at a good time for the Vikings. They need to get themselves fresh and ready to go as they come upon the most difficult stretch of their season. Three of Minnesota's next four games are on the road, with trips to Chicago, New England and Seattle looming. 9. Chicago Bears (5-3) - The Bears are one of only two teams in the NFL in Top 10 in points scored and points allowed. The Rams are the other. But Chicago is actually in the Top 5 in scoring offense (29.4 points per game) and No. 4 in scoring defense (19.1 PPG). 10. Philadelphia Eagles (4-4) - The Eagles had one of their best weeks of the season without even taking a snap. Philadelphia is just 2-5 ATS in its last seven games and has lost back-to-back home games. The favorite is 5-0 ATS in the Cowboys series, but the road team has won eight of the last 10 meetings. 11. Green Bay Packers (3-4-1) - After losing three of four, things look pretty grim around Green Bay. But the Packers have played one of the most difficult schedules in the NFL. They've had to play two of the three best teams in the game on the road - on opposing coasts - in the last two weeks. They get Miami at home this week before having to play two more brutal road games (at Seattle and at Minnesota). 12. Baltimore Ravens (4-5) - I still think that of all the teams currently below .500, the Ravens probably have the best chance for a turnaround and a playoff berth. That said, I'm tired of making excuses for this group. Maybe it simply is time for John Harbaugh and Joe Flacco to pack their bags and go. 13. Atlanta Falcons (4-4) - I expect the Falcons to be one of the biggest public plays of the weekend. However, Atlanta is just 3-8 ATS in their last 11 road games and 2-6 ATS after a win. The Falcons are also just 3-6 ATS in the second of back-to-back road games. 14. Washington Redskins (5-3) - It is unreal how bad Washington's injury luck has been over the last five years. The injury bug has taken a T-Rex-size bite out of Washington's offense. Starting guards Shawn Lauvau and Brandon Scherff are done for the year. Trent Williams is still out with a dislocated thumb. And Morgan Moses hurt his MCL on Sunday as well. Washington has literally been forced into grabbing retreads like Jonathan Cooper and Austin Howard off the street. 15. Seattle Seahawks (4-4) - Seattle has been an outstanding bounce back bet. They are 13-5 ATS in their last 18 games after a loss, and they won't pull any punches this week in Los Angeles. The underdog is 5-2 ATS in that series, and the 'under' is 12-5 the last 17 times the Seahawks faced the Rams. 16. Houston Texans (6-3) - Sorry, but I am still not buying the Texans. They may be the best of a bad bunch in the AFC South. Yet all six of their wins during this streak have come against teams with losing records, and half of them have been by just three points. Better to be lucky than good, I suppose. 17. Tennessee Titans (4-4) - I have to give credit where credit is due. This team is still not very good. But they play tough, physical football. Dion Lewis has been one of the best free agent pickups of the season. And the difference in that MNF game was that Marcus Mariotta could make plays down the field and Dak Prescott could not. 18. Denver Broncos (3-6) - There is no coherent argument to be made for keeping Vance Joseph. Just as there is no coherent argument to be made for either of his coaching decisions - game deciding decisions - involving the field goal attempts at the end of each half. Joseph completely botched both scenarios, and his shocking lack of competence when it comes to game management has moved past shocking into the realm of the hilarious. 19. Dallas Cowboys (4-4) - I feel like I am piling on at this point, but Dak Prescott just isn't very good. If he has to throw the ball more than about eight yards down the field, his accuracy is somewhere between Jeff George and Kerry Collins. He can't do it. And he has now had 10 games with multiple turnovers over the past two seasons. Prescott's end zone interception early in the first quarter was a game-changer. 20. Detroit Lions (3-5) - The Lions have dominated the Bears over the last five years, beating them three straight times and nine of the last 10. This has been an extraordinarily streaky team. But they don't look like a team that is tanking, and they should at least put up a fight this week. 21. Cincinnati Bengals (5-3) - Once again, A.J. Green is injured, and it is going to torpedo the Bengals season. They simply don't have a second option in the passing game. And anyone holding their breath for a John Ross breakout is going to suffocate. 22. Jacksonville Jaguars (3-5) - It will be interesting to see how this team responds to its two weeks off. The Jaguars body slammed the Colts twice last year by a combined 57-10 score. The Jaguars have covered the spread six straight times in the Colts series, and this game kind of looks like a Waterloo for this group. 23. Indianapolis Colts (3-5) - The Colts are 8-3 ATS in their last 11 games after a bye week, and they are 32-13 ATS in their last 45 games against teams that are below .500. Also, the home team in the Colts-Jaguars series has won six of the last seven meetings. 24. Miami Dolphins (5-4) - How on earth does this team have five wins? They have been outscored by 38 points on the season, and their stats are closer to a 2-7 or 3-6 team than one that is above .500 and somehow involved in the AFC playoff race. Miami has lost its last three road games by an average of 20 points per game. 25. Cleveland Browns (2-6-1) - It would have been really interesting to see how this season would've gone for this team if they had won some of those early games. Remember: they absolutely should've won against Pittsburgh, New Orleans and Oakland and should've started the season at least 3-1. Would they have still imploded? Would things still have come off the rails? I guess we will never know. 26. New York Jets (3-6) - I don't know why the Jets are so frustrated. Did this team actually think it was going to compete this year? They were massive overachievers last year and were starting a rookie quarterback (for some reason). What did they think was going to happen? The good news is that they have Buffalo coming to town. The home team is 4-1 ATS in this series and the Jets are 10-3 ATS in their last 13 home games. 27. Tampa Bay Buccaneers (3-5) - This is as bad of a defense as I have seen in a long, long time. The Panthers were basically making fun of them by constantly running reverses and misdirection plays once it became obvious that the Bucs defense has the pursuit ability of a five-year-old soccer player. Mike Smith took the fall for this unit. But the fact is that their defensive roster is comically bad. 28. Arizona Cardinals (2-6) - Over the last 14 years, NFL teams off a bye week have gone 228-195 ATS. The "extra week of rest" is one of the most overrated handicapping angles in football. 29. San Francisco 49ers (2-7) - Slow down on the Nick Mullens love. This Shanahan System on offense has proven - for more than 25 years - that you can plug in almost anyone and turn them into a decent quarterback. What was more shocking was that some guy named "Mostert" led them in rushing, and Middle Tennessee grad Richie James was their top receiver. You can literally plug in guys off the street and they can put up numbers in Shanahan's offense. 30. Oakland Raiders (1-7) - Just keep telling yourself, Raider fans: five first round picks and $68 million in cap space. 31. New York Giants (1-7) - Here is why stats lie and that watching (and re-watching) a football game is better way to analyze it than simply looking at the numbers: Eli Manning is fourth in passing yards, has the best completion percentage of his career (68.3%) and his 7.5 yards per attempt is one of the best marks of the career. However, anyone that has actually watched Manning can attest to his obvious incompetence and overall shoddy play. 32. Buffalo Bills (2-7) - Nathan Peterman! I honestly hope that he gets 1,000 more chances and that he never loses his starting position. He might be my favorite quarterback of all time. There aren't too many guys that get you excited about a potential pick-six every time he drops back - only to see him come through time and time again! In Buffalo's last 75 drives they have three offensive touchdowns for them and three defensive touchdowns allowed for the other team. I will never know how this team beat Minnesota. Ever. Throughout the season I will have my NFL Power Rankings every Tuesday. My next ones will be released on Tuesday, Nov. 13.